1. Cook the potatoes in a large pan of boiling water for 15 minutes, add the round beans and broccoli and cook for a further 3 –4 minutes until all are tender. 2. 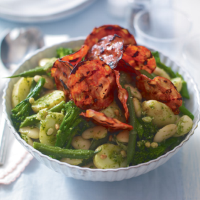 Drain the vegetables, place in a large serving bowl with the butter beans and pesto and toss well together. 3. Heat a large frying pan and cook the chorizo slices in batches for 1 –2 minutes on each side until they are crispy. Pile on top of the salad and serve warm. This Spanish rosé with its generous primary, strawberry freshness stands up to the flavour of the chorizo perfectly: Gran L_pez Tempranillo Rosado, La Mancha.